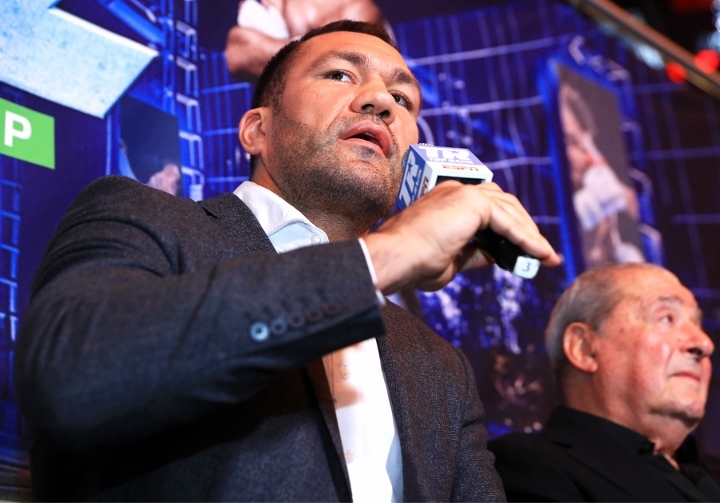 Heavyweight contender Kubrat Pulev has come out swinging at the recent allegations by a female reporter, who last week made headlines after a video captured Bulgarian kissing her during an interview. Reporter Jennifer Ravalo, also known as Jennifer SuShe, interviewed Pulev after his 27th victory in a fight against Bogdan Dinu in Costa Mesa, Calif., on March 23. After answering a question, Pulev – seemingly out of the blue – gave her a kiss. On Thursday, Ravalo appeared with high-profile attorney Gloria Allred and called for Pulev’s license to be suspended. She also called on the California State Athletics Commission to investigate the incident. “I’m not at fault and during the course of my career I’ve already had tens of of thousands interviews. Everyone knows me as a friendly and polite person. The woman came to me during the weigh-in and said, ‘after the fight we’ll party.’ That’s not true [that I grabbed her buttocks]. And by the way: This woman is not my type. I’m not afraid, I also have videos if necessary,” Pulev said to German daily BILD. Veteran trainer Ulli Wegner (76) backed up his fighter’s version of the events. “I was right next to it. It was after the fight. Kubrat was interviewed by a pretty, very friendly young woman. Yes, and then he gave her a kiss. That was out of the emotion. The claim that Pulev had caught her buttocks is not true,” Wegner said.